Thanks to the assistance of Instagram user writerlydosageofinspiration—an effort by Lelia Strong at The Writer’s Block—the 30 Days/30 Chapters pages, as found somewhere in the NaNoWiMo forums, I was able to get my hands on clean copies of this simple yet powerful outline. I did a little dance when I received the clean photos because finally the somewhat elusive skeleton of a novel had finally reached me hands. Then my brain said, “Don’t stop there, D…” and I transcribed the photos into my Evernote so that I could refer to it when I wrote. Again, my brain said, “Don’s stop there, D…” and I realized the synthesis of awesomeness and efficiency with within my grasp. 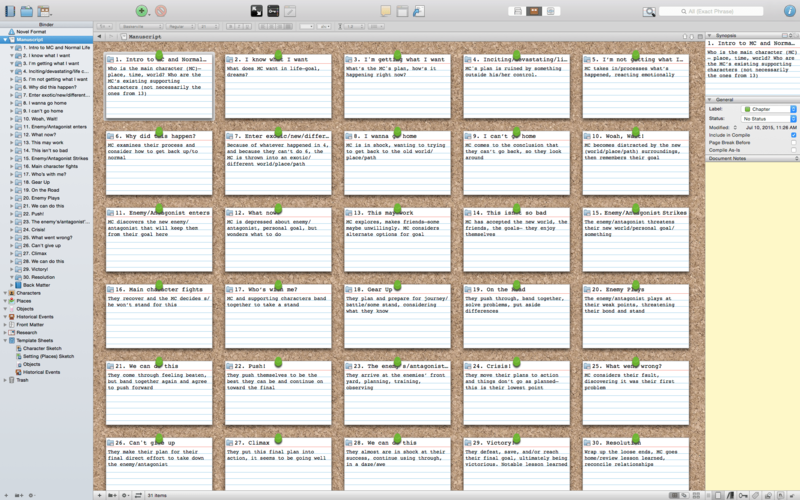 I started with a blank Scrivener Novel Format and set up thirty chapters. Then I titled each chapter and set the description within the index card. 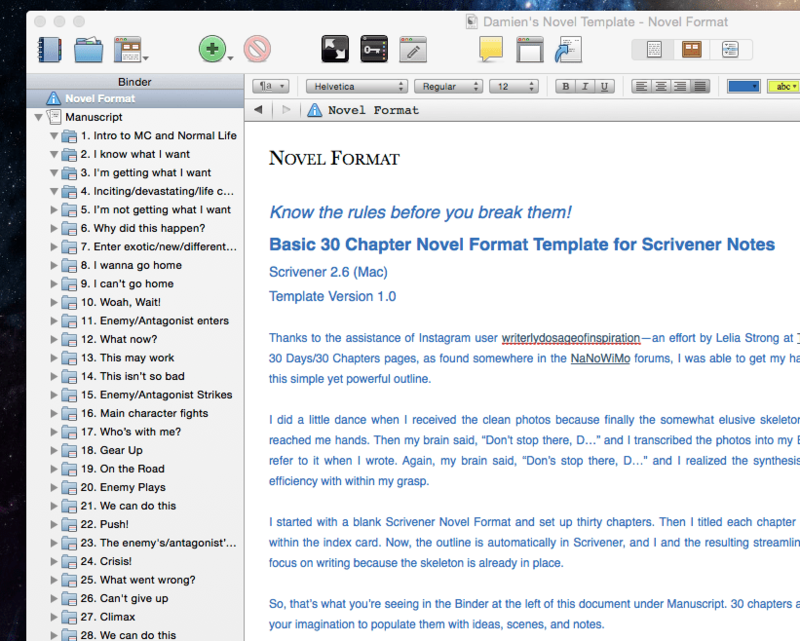 Now, the outline is automatically in Scrivener, and I and the resulting streamlining allows an author to focus on writing because the skeleton is already in place. Update: Click here for the for the 30-chapter text file template in MS Word .docx format. Update: Click here for the my Character Bio template in MS Word .docx format. I do not know who originally typed those pages, and my Google searches have turned up fruitless. So, tremendous thanks to whomever set up the basic outline for writers to use. And now through the magic of technology, that outline is available as a Scrivener Template for you to use. The original images can be found at the bottom of this document. You only need to determine a few things to start writing! I updated the Character Sketch Template—a result of combing the internet and using multiple versions. This one has “everything.” You don’t have to try to fill it all out for each character. I added an Objects template and folder—helpful in sci-fi, so that you can track all the weird things and their details. I added a Historical Events template and folder—helpful to track things of the past that inform the future. These might be stand alone, or might include a complete back story that you use later in a scene. I will update this template as necessary and repost it here.